UPDATED: Environment Minister Vidar Helgesen from the Conservative Party faces a lack of confidence vote in Parliament, after he halted a wolf hunt approved last year by the Parliament because the justice ministry deemed it was illegal. Now the anti-wolf movement led by the opposition Center Party plans to order Helgesen to change current regulations to allow shooting more wolves, even within zones where they’re supposed to be protected. The Center Party clearly believes that hunting interests, support for rural districts and residents’ fear of predators are more important than current law. “The minister is in reality being put under administration by the Parliament,” Marit Arnstad, leader of the Center Party’s MPs, told news bureau NTB. Center Party leader Trygve Slagsvold Vedum, who has been using the wolf debate to his party’s political advantage for months, also has decided to call for a lack-of-confidence vote in Helgesen, whose interpretation of Norwegian law and international conventions had been hailed by environmental organizations including WWF. It was unclear, however, whether Vedum would win support for his ouster proposal, which was generating some angry reaction on Thursday. Rasmus Hansson, the Greens Party’s lone Member of Parliament, called Vedum’s proposal to oust Helgesen “nauseating.” He accused both the Center Party and the Labour Party, which look likely to join forces after the next election to form a new left-center government, of “climbing over each other in a populistic hunt for voters.” It was also unlikely that Vedum’s own party and its partner in government, the Progress Party, would vote to fire him. With the end of wolf-hunting season looming at the end of April, Vedum maintained that Helgesen has been delaying and working against the intentions of the Parliament. 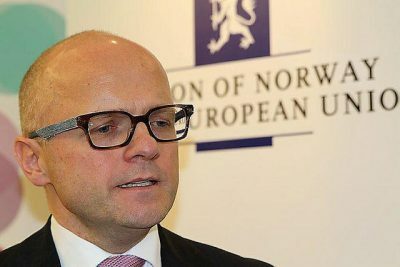 “Helgesen has undermined the Parliament’s compromise on the wolf issue,” Vedum told state broadcaster NRK. “The wolf conflict has never been greater, so we unfortunately can’t say that we have confidence in him any longer. He noted that Helgesen’s own Conservative Party had agreed with its government partners and the Labour Party last year to reduce Norway’s wolf population. That led to a decision to shoot nearly two-thirds of Norway’s wolves, which led to massive debate both within Norway and internationally. Helgesen thus won the respect of environmentalists when he, after evaluating an appeal of the pending wolf hunt, determined that the wolf population reduction approved by the politicians violated both international commitments to protect endangered species and Norwegian regulations. That set off more howling, led by Vedum and farmers who let their sheep graze freely. Helgesen cut the number of wolves to be shot from 47 to 15 and decreed that no wolves could be shot within designated wolf zones. By that time, MPs from his own party with rural constituencies ready to defect to the Center Party turned against him as well. Helgesen responded by proposing to change Norwegian law on wildlife diversity to make it easier to hunt wolves within the wolf zone, but that didn’t satisfy the critics.